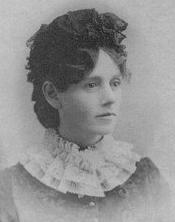 Mary Caroline "Myrtle" Page Fillmore was co-founder of Unity, a church within the New Thought movement, along with her husband Charles Fillmore. Myrtle Fillmore was also known as the 'Mother of Unity'. Myrtle was born and raised in Pagetown Ohio, U.S. She had seven siblings and her father was a businessmen in Ohio. Although both her parents were strict Methodists, Myrtle rejected their puritanical teachings. From a young age and well into her teen years, Myrtle developed a strong enjoyment for reading. At the age of twenty-one, she enrolled in a one year Literary Course for Ladies at Oberlin College. She graduated in 1867 and began teaching in public schools in Clinton, Missouri. Myrtle would spend the next thirteen years of her life there, except in 1877 and 1878, when she traveled to Denison, Texas to fully recover after contracting tuberculosis. While in Texas, she met Charles Fillmore whom she married in 1881. They both lived in Gunnison, Colorado, but later moved to Pueblo, Colorodo, where their first son, Lowell (born in 1882) and Rickert (born in 1884), were born. The family then moved to Omaha, Nebraska and then to Kansas City, Missouri, where they had a third son, Royal (born in 1885). Myrtle Fillmore, along with her husband Charles Fillmore, founded the International Unity Movement. In the midst of their studies in Christianity, Myrtle and her husband were seeking a 'oneness' among all of the dozens of Christianity's conficting denominations. They desired to unify the Christian teachings, and the vision of 'oneness' they shared and shaped together led to The Unity School of Christianity, which 100 years later still operated as a global outreach. Unity became a very important 19th century American Religious movement. Myrtle's own personal experiences with prayer also led to the creation of the Silent Unity Prayer Ministry. In 1893, Myrtle began publishing a children's magazine titled "Wee Wisdom" and published a children's book titled "The Wee Wisdom's Way". She went on to write many more books relating to Unity and Divine Science. Myrtle Fillmore also served as a minister of The Unity Society of Practical Christianity and director of The Silent Unity Department. Throughout her life, Myrtle also wrote thoughtful, joy-filled letters to people from all around the world who were requesting prayers. These letters became the source for her books "Myrtle Fillmore's Healing Letters" and "How to Let God Help You". Myrtle Fillmore died in 1931 at the age of 86. Her husband, Charles remained active at Unity until his death in 1948. The ashes of both founders were reportedly scattered from the Bridge of Faith into the flowing waters below. Today, the Unity School, with headquarters located near Kansas City, sponsers 24-hour telephone prayer ministry and enrolls fifteen hundrer students each year, along with offering a ministerial training program. The Unity publishing company produces many publications, including The Daily Word which circulates in over 50 countries. Charles and Myrtle Fillmore - The Later Years - "Unto Eternal Life"